I can’t think of a sport where rules are molested with as much glee and abandon as they are in motorsports. That’s part of what makes racing so great: the devious and clever ways that teams will attempt to squeeze out some kind of advantage are a fascinating part of the sport. There are a lot of legendary standouts in the history of racing and cheating, but the one I’d like to geek out with you over today is the Toyota Team Europe Turbo Celica cheat of 1995. This is pretty well-known in the history of motorsports and cheating, but I realized we’ve never really given it a close look here, and that just can’t stand. This is a cheat that is so elegant, so devious and requires so much work and craftsmanship that you’d almost think it would have been easier to just put that effort into actually trying to win by the rules. You’d be wrong, of course, because this cheat is so good that I think even a loss and getting caught—which is what happened here—is, in the end, a much more fascinating result than some boring, old honest victory. 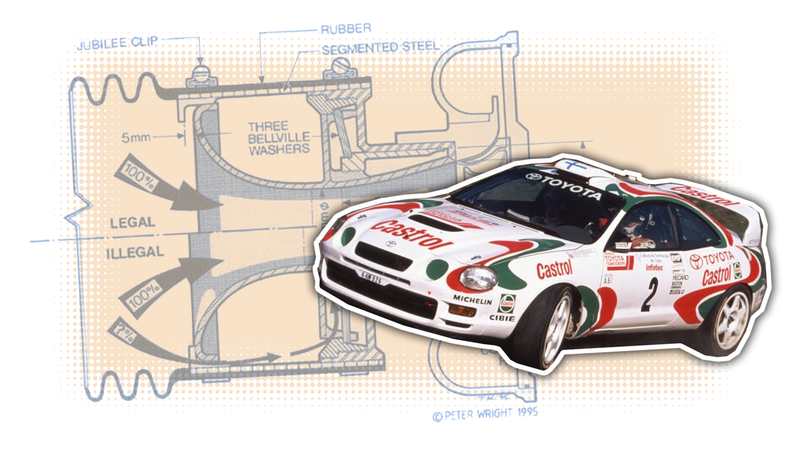 Toyota Team Europe had been campaigning the Celica GT-Four in the World Rally Championship series with a good amount of success for several years. The competition was, as always, very tight—meaning every team was looking for some way to gain an advantage. For Toyota, the opportunity came via a pretty oblique path: a safety ruling issued by the FIA, the governing body for motorsports. Essentially, the FIA wanted to find a way to get the rally cars to slow down a bit, in the hopes that they’d be less likely to crash into the crowds of spectators that tended to line the rally courses. Well, that, and to be safer in general. Since most rally drivers don’t bother looking at speed limit signs, the FIA mandated that for the turbocharged engines used by the rally cars, they would require a restrictor plate to limit the amount of air the turbo could draw into the engine, thereby limiting the engine’s power to levels the FIA found more tenable. It was via this restrictor plate that Toyota found their loophole. They redesigned their turbocharger to have the FIA-mandated restrictor plate, just like anyone else, but Toyota found a way to have that restrictor effectively disengage itself when installed on the car. It’s not just that they made a restrictor plate that didn’t actually restrict; anyone could have done that, but they’d have been caught. The WRC racing officials were very capable and thorough when it came to inspecting engines and parts for cheating. The scrutineers knew exactly the sorts of things they needed to look for, and they weren’t afraid to take engines apart and inspect every little detail for evidence of shenanigans. These were perhaps the most difficult people to try to pull a mechanical fast one on, and yet that’s exactly what Toyota did. The brilliant part of Toyota’s cheaty turbo was that when the part was removed and inspected, it appeared to be a completely normal, rules-compliant turbo with a restrictor plate. The difference was, though, that when the part was installed, the very act of installation changed the internal geometry of the part. So, the top half there shows the turbo and restrictor unit in its ‘legal’ configuration, a configuration it could only be in if the part was removed from the car for inspection. When installed, the rubber hose that connected the turbo to the car’s air intakes had an internal segmented-steel re-enforcing ‘cuff’ at one end. This sort of thing isn’t all that unusual for a hose in a racing car, so I don’t believe it would have struck anyone as odd. This cuff didn’t just help keep the hose intact—when it was connected to the turbo unit and clamped on with hose clamps, the metal rings pushed a set of springs, made from three springy, dish-shaped bellville washers, into a different position. In this second position, the whole restrictor assembly would be slid by 5mm from the turbo intake, and in doing so, open up extra channels for airflow that increased the amount of air entering the turbo by, some sources say, up to 25 percent more. That 25 percent more air could yield up to a 50 horsepower bump. When you consider that the WRC cars of that era had 300 HP, that’s a very significant bump. So just think about it—the restrictor plate had two positions, one legal, one not. The legal position would be the ‘default,’ since the springy bellville washers would push and hold the plate in the proper position unless something were to act against those springs. That something that would act against those springs was the air intake hose assembly, so anytime the part was installed on the car, it cheated, and any time it was removed for inspection, it was innocent. It’s brilliant! Man, it sounded like Toyota was just about to sell Mosley a whole crate of these things. Of course, Toyota was banned from the WRC that season and from other rallies and the 1996 WRC, too. 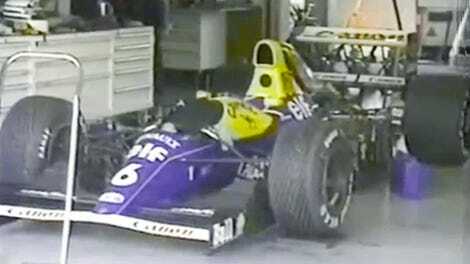 Toyota insisted that management knew nothing about the cheat, because of course, they said that. And it was said the drivers had no idea why their cars were so much faster than everyone else’s, either. After 12 months, TTE was back racing. In a perverse way, I respect this cheat almost more than I would have if they had just won the season. Cheating’s part of racing, and seeing such a clever, well-executed cheat like this makes my miserable and devious heart just glow.